On 21 December 2017, eight-year-old Ethiopian Sefadin Yisak speaks about his friend on the hill, Adam, a nine-year-old, South Sudanese refugee boy. When boundaries, legal restrictions and cultural differences can divide communities, it is the children who remind us of the great importance of social integration. Children truly know no borders. To Sefadin Yisak, an Ethiopian student at Tsore Arumela Ethiopian Primary School, Adam, a South Sudanese refugee who attends primary school within the neighbouring refugee settlement, is just his good friend. Sefadin doesn’t see the differences in history, culture or in the quality of educational services. He only sees the South Sudanese refugee boy as his good friend that he met at the river over the summer. They meet and play in the water with other neighbourhood kids when they don’t have school or other chores to do. But from an adult’s perspective, it is evident that educational services have not been equal between refugees and their host-Ethiopian communities. With the host primary school only a 15-minute walk from the refugee settlement, one can truly notice the differences. In addition to their struggle to survive and flee from conflict, the South Sudanese refugees experience lack of quality education due to unskilled teachers, overcrowded class sizes and exclusion from the national educational system and the services it provides. On the other hand, some refugee settlements have in some cases benefited from other services, including better-constructed classrooms, play equipment and materials for teaching, while the host communities often experience a lack of funding to improve classroom infrastructure and educational materials. Thus, these inequalities in educational provisions can create social barriers that could potentially build unnecessary tension between communities. In reality, there are more similarities between the communities than differences, such as language, food, family customs, and a passion for education. When South Sudanese people residing in Ethiopia for multiple years (some over 20 years, some less than one year), and children from both communities – like Sefadin and Adam – show us the importance of integration, it is crucial to support this clear demand. Institutions have started recognizing the need, and in response have begun providing services that support integration. With the support of the United States Government (US-BPRM), UNICEF has been working with partners – the Ministry of Education, the Administration for Refugee and Returnee Affairs, UNHCR, and Save the Children – to bring equitable and efficient educational services that spark social cohesion for both communities. Ahmed’s teacher training programme is a prime example. In his region of Benishangul-Gumuz, 149 refugee teachers and 225 host-community teachers have all taken part in the new UNICEF-developed teacher training flagship programme, Assessment for Learning. This new approach shows teachers how to implement continuous assessment techniques to better understand the learning gaps of children and respond accordingly. It is the first of its kind – where refugee and national teachers learn the same skills at the same time. Ahmed and other teachers from both communities stayed in the same dorms for the 10-day course, learned from each other, and now feel more part of each other’s communities. Before this training, refugee and national teachers never interacted professionally. They were trained with different programmes, and in most cases, it was the refugee teachers who missed out on professional development and teacher enhancement opportunities. Now, with more equality in refugee and host-community teachers’ knowledge and skills, Ethiopian students, like Sefadin, and refugee students, like Adam, both benefit from teachers who were trained in the same teacher training programme. What’s most exciting about the integrated response is the development of sport and play activities. 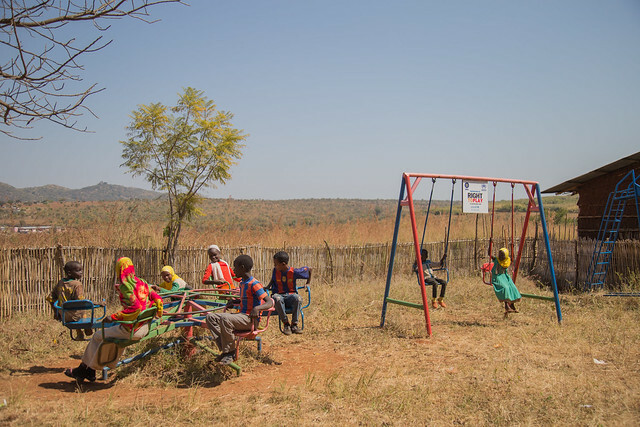 Both communities now enjoy new play equipment and learning and play materials such as balls, toys, puzzles, counting blocks, and others. Teachers are trained on the “Connect, Reflect, Apply” approach, to develop useful life skills in children. Both Sefadin and Adam now have new equipment to play and are learning the same life skills, in addition to enjoying the benefits of new solar-powered TV’s that display educational programmes. While some refugee settlements in Ethiopia have experienced integration, in terms of students attending the same school, teacher training integration, or social cohesion through extra-curricular activities, many communities still lack support for equitable integration. Communities have started to integrate, whether it be working for each other during harvesting season, inter-marriage, or making friendships while playing in the river. Even Sefadin’s family is now supporting Adam’s family with food provisions, like sorghum, maize and mango. When boundaries, cultural differences, and varying educational services can divide communities, it is the children – like Ethiopian Sefadin and South Sudanese Adam – who remind us of the great importance of social integration. 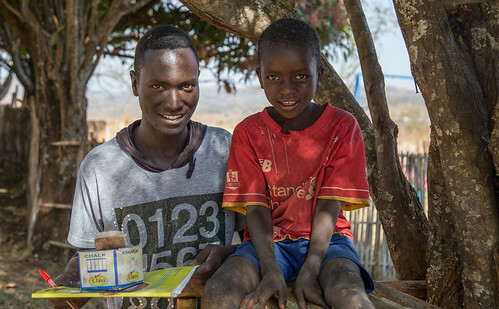 UNICEF continues to work with partners to implement programmes that spark integration of refugees and host communities in all five refugee-hosting regions of Ethiopia so that cross-cultural friendships, like that of Sefadin and Adam, can be supported with an equality in educational services. Author UNICEF EthiopiaPosted on January 22, 2018 January 23, 2018 Categories Benshangul, Education, Emergencies, Ethiopia, HIS, OFDATags Education in emergency, innovation, learning, Refugees, school, South Sudan1 Comment on A child’s example demonstrates the need for integrating educational services for refugees and host communities in western Ethiopia. ADDIS ABABA/HAMBURG, Germany/NEW YORK, 11 July 2017 – Funding shortfalls are threatening education for millions of children caught up in conflicts or disasters, UNICEF said today ahead of the G20 summit in Hamburg. Of the $932 million needed this year for its education programmes in emergency countries, UNICEF has so far received recorded voluntary contributions of less than $115 million. The funds are necessary to give 9.2 million children affected by humanitarian crises access to formal and non-formal basic education. Funding gaps for UNICEF education programmes in some of the world’s hot spots vary from 36 per cent in Iraq, to 64 per cent in Syria, 74 per cent in Yemen and 78 per cent in the Central African Republic. In Ethiopia, the education system remains vulnerable to natural disasters and manmade emergencies despite the significant advancements in expanded access to general education for children and young people. The past two years of successive drought have forced many students to drop-out of school and have lessened the quality of education, with hundreds of schools closing and families, including students and teachers, moving in search of water. At the end of the 2016/17 academic year, over 200 primary schools remain closed. UNICEF Ethiopia works closely with the Ethiopian Ministry of Education to ensure equity and access for all children to education in the country. Interventions include the planning and coordination of education emergency responses and supporting the Ministry of Education to ensure that assistance to schools across the most drought-affected regions is efficiently targeted. UNICEF also assists regional education bureaus with the provision of primary school teaching and learning materials, water and sanitation services to schools, as well as support to offset the additional costs schools are bearing to stay open during drought. Furthermore, communities hosting displaced families and their children have been provided with temporary learning facilities. In 2017, an estimated 2.7 million children require support to continue their education, including nearly 100,000 internally displaced children. In addition, an estimated 369,038 refugee children require further support to enable access to educational facilities. As of early July, the funding gap for the education sector’s 2017 commitment remains at 57 per cent, with only US$5 million of the required US$11.6 million available to ensure children in emergency-affected areas stay in school. More than 25 million children between 6 and 15 years old, or 22 per cent of children in that age group, are missing out on school in conflict zones across 22 countries, according to a recent UNICEF analysis. Across the globe, nearly 50 million children have been uprooted – 28 million of them driven from their homes by conflicts not of their making, and millions more migrating in the hope of finding a better, safer life. Refugee children and adolescents are five times more likely to be out of school than their non-refugee peers. Lack of access to education is particularly high among children on the move, with half of the world’s child refugees not able to start or resume their learning. In 2016, just 3.6 per cent of global humanitarian funding was spent on education. $8.5 billion is needed annually to close this gap. Available funds are often short-term and unpredictable, resulting in high levels of disruption for children and their education. During the first World Humanitarian Summit held in May 2016, UNICEF and partners launched the Education Cannot Wait fund aimed at addressing the funding gap to 13.6 million children with educational support over five years, and 75 million children by 2030. In 2016, a total of 11.7 million children in humanitarian situations were reached by UNICEF with educational support. See the global press release here. FEDIS, OROMIA, 31 May 2017 – “Our daily routines have changed. We used to give water to our animals every other day, now they drink daily. I used to bath the children once per week, now I have no idea how many times a day they wash because they always come use the tap on their own,” says Saada Umer, pointing to her 4-year-old, Anissey, who is near the tap. 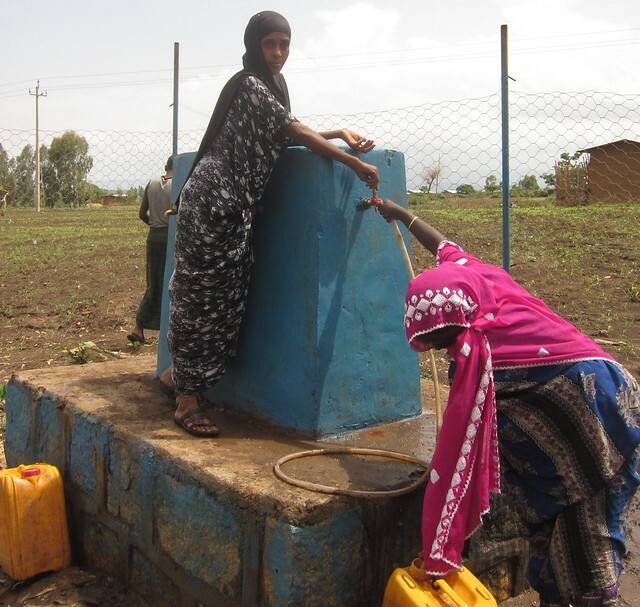 Saada, 26-years-old, is one resident who benefits from the new water supply system in Fedis woreda (district). She and her husband are farmers and have four children, ranging from 2 to 9 years old. Rather than filling 20 litre jerry cans daily at a water point a few kilometres away, she fetches it from her front yard where the tap flows anytime. The impact is literally life-changing. Ethiopia has faced devastating drought conditions for the past two years now, affecting different areas of the country in different seasons and creating rippling effects in health, education, the economy and development initiatives. In times of crises, emergency action is required and often takes priority over development initiatives, understandably, to save lives and curb any potential disease outbreaks. However, one emergency action by UNICEF, with funding from the German Development Bank (KfW) and the UK Department for International Development (DFID), supported the Government of Ethiopia to address both the drought-related emergency water shortage affecting 8,600 people while also contributing to a more resilient and long-term supply of water. In Boko town, the drought had taken its toll at the same time that the town’s water supply system had run its 25-year design course, leaving thousands without access to clean and regular water. In times like these, those who can afford pay for expensive water brought in by vendors and those who cannot afford, take from ponds and rivers. UNICEF Ethiopia purchased a pump and generator to supplement the drilling of a new borehole the regional and zonal water office initiated, providing further construction support to complete the project. The emergency-funded project enabled the water office to make functioning a 122 metre borehole which, as of February, supplies fresh, clean water by keeping two town reservoirs filled. In addition, it supplies 24-hour water taps in about 800 households in Boko, with water points at the edge of town providing safe water for surrounding rural villages. The borehole also supplies a water-trucking point nearby, where currently four trucks carrying two 5,000 litre water tanks are filled daily and supplied to the nearby Midega Tola woreda, which is lacking a water system while grappling with drought. The effect of having household water has led to the creation of a town utility office, which records the water meters and collects payment for its use. Setting up this regular system has not only created more demand for household taps, it ensures steady water supply and a regular income to employ plumbers and maintenance crews for water system maintenance. Hikma Mesfin is a 25-year-old Water Attendant at one of the town’s new water points. Her job is to open the point each morning, collect ETB 25 cents (US$.01) per jerry can from the users throughout the day, manage the site and close up each evening. Her salary is paid by the utility office, another regular income supported by the system. While emergency times call for emergency measures, UNICEF and the Government of Ethiopia collaborate to ensure the most sustainable solutions possible are implemented where it is most needed. As the effects of protracted drought continue to wreak havoc on lives across the country, UNICEF calls on the support of international donors to fund projects such as deep borehole drilling which build resilience in communities and offer long-term solutions for challenges facing communities across the country. DASENECH, SOUTHERN NATIONS, NATIONALITIES AND PEOPLE’S, 6 April 2017 – A primary school located in the midst of pastoralist territory is no simple feat. Mobility is the central theme of pastoralism, or livestock-rearing livelihoods and pastoralists make up nearly 20 per cent of Ethiopia’s 94.3 million population. In the deep south along the border with South Sudan and Kenya, agro-pastoralism is commonly practiced. They are semi-mobile as they tend to large herds of animals and grow crops. While historically, pastoralists are one of the most isolated and vulnerable groups, more and more are receiving the opportunity to attend school. The Naikia Primary School offers grades 1 through 4 within the walls of the two-building, single-story school. It is located in the remote Dasenech woreda (district) in the Southern Nations, Nationalities and People’s (SNNP) region. The school is a centrepiece amongst the four villages which comprise the Naikia kebele (sub-district) and serves 193 children from the 1,695 nearby residents. Until 2005, there was no school in the kebele. The Government of Ethiopia began implementing pastoralist education strategies at that time and Naikia kebele was one of the locations where an Alternative Basic Education Centre (ABEC) was constructed, with support from UNICEF. The ABEC provided flexible, simplified lessons based on the national curriculum, designed specifically to extend the reach of education to pastoralist families. The community readily accepted the change, and in 2009, the ABEC was upgraded to a primary school, designed to also support a distant ABEC further in the woreda. Over the years, UNICEF has provided teacher training, furniture and educational materials to the school. Allegn Arsena, 11 years old, is one of the fortunate students to have attended all four years and speaks Amharic well because of his education. I was curious upon first meeting him if he had ever had to drop out for some time, to look after animals or help his family. Upon asking him, he admitted, “Yes,” He paused before going on to tell me he had once been sick and missed an entire three days of school. Otherwise, he has been in attendance every day and even stays after class finishes to continue reading and studying. In fact, with little else to do, it seems most students and teachers and even community members stay around the school once classes are over, with the students carrying on their studies while others connect and talk. Conversation quickly turns to the current drought and how it is affecting everyone. The South Omo zone is one of the few in SNNP region, along with parts of Oromia and Somali regions, which has been affected by recurring drought. After suffering through the weather phenomenon El Niño in 2015 and 2016, the Indian Ocean Dipole (IOD) has caused failure of vital seasonal rains yet again. Dasanech is already underdeveloped and the IOD drought has intensified the dire situation. “Sometimes I am late in the morning because there is no water available at the school and each of us has to fetch water to provide for the school feeding,” says one student. Her comment is amplified by resounding noise from the crowd of students, a motion I take to mean they have all experienced being tardy for the same reason. Each student provides a share of water every day, the parents provide firewood and the school provides cracked wheat and haricot beans, supported by the World Food Programme. The essential school feeding has a solid track record for keeping kids in school, particularly in drought-stricken areas; one factor enabling students to learn. Not every child in the neighbourhood has the opportunity to learn, however. Interestingly, there are more females than males in the school, and once past grade four, there are far fewer females than males going on to attend grade five. The reasons why are simple to explain, yet hard to fathom. 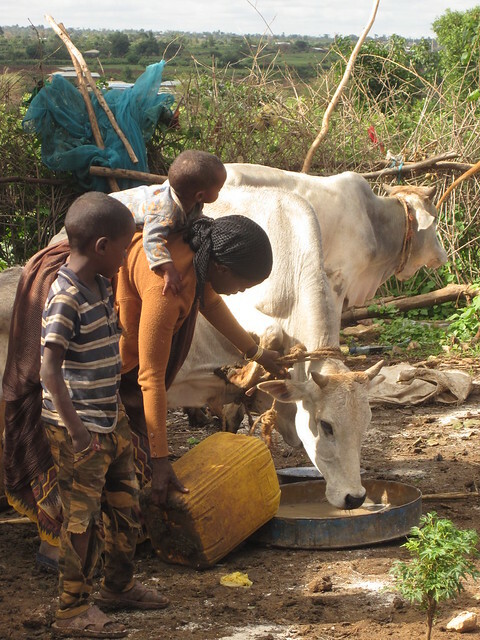 Pastoralism requires people to watch the livestock and parents often have to pick which children may attend school and which must tend to the animals. Often it’s a one-time, consistent decision. “I have two boys of similar age. When they reached school age, I had to select one to go on that path and the other to watch animals. It was a hard choice but I had to make it,” explains Nassiya Tabahai, a mother living in Naikia. To continue education past grade four, students must attend another school in the woreda capital about 26 km away. For cultural and safety reasons, most families are not comfortable to send their young daughters to live outside of the family home. Facing limitations in many respects, the resilient community is proud of their 193 students and notes the importance of education. “A man who is not educated fights but an educated man has power and resolves conflict without fighting,” An elder gathered at the school explains. 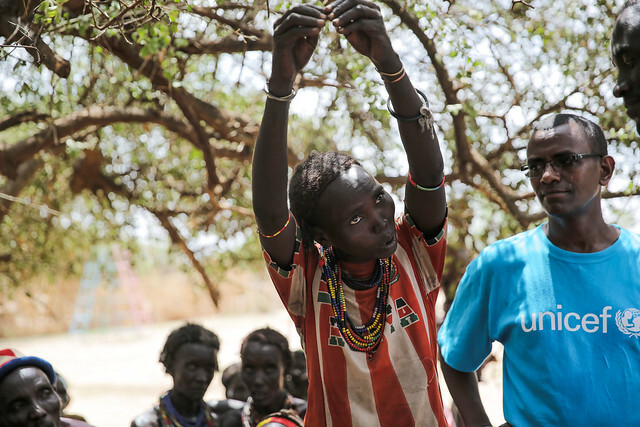 UNICEF is committed to support the Government of Ethiopia’s pastoralist education strategies and to support those communities most affected by drought. Together with the Government and international donors, the progress witnessed at Naikia can continue and be replicated and expanded across pastoralist territory. For every child. This past week we have met countless women and children in the Somali region of Ethiopia who have made astonishing efforts to combat the debilitating drought that is afflicting the area. We saw families displaying incredible strength and resourcefulness. What we didn’t see was a humanitarian catastrophe like the ones that happened in generations past, because the progress made by these families mirrors that made by Ethiopia in response to food insecurity and drought over the last two decades. Ethiopia now has both the determination and the ability to help its people cope better with a disaster. And yet as we saw firsthand, Ethiopia’s much celebrated development progress could be at risk in the wake of these successive droughts. Over the last 20 years, the Government of Ethiopia and the international community joined efforts to improve conditions for millions and millions of Ethiopians. Today a concerted and urgent response is required if these families are to avoid a humanitarian crisis, a quarter of a century later. In 2016, Ethiopia’s highlands were battered by drought amid the worst El Nino in generations, but managed to avoid a major catastrophe through a well-coordinated response, led by the Ethiopian Government with support from the international community. The country had only begun to recover when a new drought struck the country’s lowlands. The Somali region, which lies in the east of Ethiopia, has been the hardest hit by the effects of these recurrent droughts, with over 30 per cent of the region’s population now requiring food assistance. The current rainy season in the lowlands appears to be failing as well. As a result, food insecurity throughout Ethiopia is forecast to rise sharply from the current 7.8 million people in the next few months. An estimated 303,000 children are expected to suffer from severe acute malnutrition – the type that makes a child nine times more likely to die of diseases including acute water diarrhea and measles. 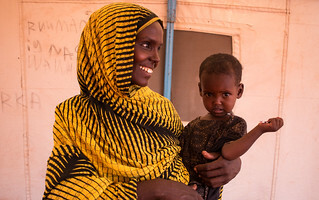 An estimated 2.7 million children, pregnant women and breastfeeding mothers will be diagnosed with moderate acute malnutrition in drought areas; without urgent action, the condition of many of those children could deteriorate into severe acute malnutrition, a life-threatening condition that is harder and more expensive to treat. It is likely that needs will further increase in the coming months, compounding the current problems. UNICEF and WFP are committed to supporting the many people we met this week with a well-coordinated response. WFP has mounted a food and nutrition response of significant magnitude and, in partnership with the government, is currently supporting 6.4 million people out of the 7.8 million in need with emergency food assistance. The remaining 1.4 million people are receiving support from the Joint Emergency Operation (JEOP) – an NGO consortium. Moreover, WFP is also providing nutrition support to 1.3 million mothers and young children suffering from moderate acute malnutrition. WFP is also taking the lead in the provision of logistical support to government, UN and international NGO partners which is central to the response. Across Ethiopia, UNICEF with partners has reached close to seven million people in the first quarter of 2017, with an emphasis on providing safe water and emergency nutrition support. Critically, government with support from UNICEF have just completed a national measles campaign targeting more than 22 million children across the country. 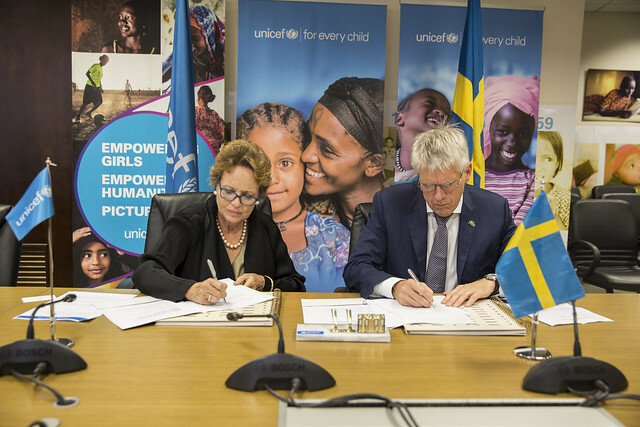 And UNICEF is extending its education and child protection interventions that will reach hundreds of thousands of children, focusing on the provision of temporary learning and play spaces, working with communities to prevent and respond to family separation, at-risk migration, child marriage, and gender-based violence. However, needs far outstrip available resources. Acute funding shortages are hampering our collective ability to act at scale. The international community and the Government of Ethiopia must increase funding urgently or the humanitarian success story of 2016 might be overshadowed just one year later by a story of acute crisis. UNICEF requires $93.1 million to meet the drought-related needs of children and their families across the country in 2017, in terms of Nutrition, WASH, Health, Child Protection and Education in Emergencies. WFP currently has only enough food to last through June, and requires a further $430 million to meet the current emergency food and nutrition needs to the end of the year – and both WFP and UNICEF will require additional resources if the needs rise in the next few months as predicted. Between 2000 and 2016, mortality rates among children under age 5 were cut by a remarkable 40 per cent in Ethiopia, and stunting rates were reduced dramatically from 58 per cent to 38 per cent. It is crucial that the gains made during the last 20 years are not reversed by the current drought.